Kona Kailua’s Ali’i drive has a little something for everyone. Maui has its Hanna Highway. The Big Island has its Ali’I Drive, a fascinating area rich in royal history. The Kamehameha and Kalakuaua Dynasties ruled Hawaii from the late 1700s to 1893. During this time, each dynasty visited, lived and ruled along Ali’i Drive. There were temples built and battles fought. You can visit what remains of those temples today. But if Hawaiian culture is not your thing, there is still plenty to do along Ali’I Drive. Because it parallels the coast, Ali’I Drive has plenty of ocean-associated activities going on. You can watch the boats and the fishermen at the Kailua pier. There are a number of beaches and bays along the drive that you can explore. Walk along the sea wall and watch all the ocean activity: crabs, sea turtles, and all the activities going on out in the ocean. Watch the people. Have a picnic on a shady lawn. Savor the sunset. Oh, and the shopping. There are plenty of places to pick up your sea-themed souvenirs to take back home. Some are strewn out along the drive. Others are more concentrated. The Kona Inn Shopping Village (5744 Ali’i Drive) is located on the waterfront. It boasts of over 65 stores including art galleries, gift shops, and some excellent restaurants. Shop to your heart’s content. They are open from 9 to 9. Drive a couple of miles south and you have another concentration of shops at the Ali’i Gardens Marketplace (6129 Ali’i Drive). They claim to have 50 shops but the actual number tends to fluctuate with the economy. You can buy clothing, Kona coffee, fresh flowers, and fresh produce. For many, this place serves as a farmer’s market. Besides the coffee and produce you can buy, you can purchase a number of handmade products like art and jewelry. At the north end of Ali’i Drive is Kailua Bay where there is plenty of action, including the spot where the Ironman World Championship swim begins, and the running segment of the race ends. The seawall there is a great place to watch both people and wildlife. The Kailua Pier has anchored the city since the early 1900s and was once the center of shipping and transportation. It still serves as a hub for ocean recreation, especially fishing. The Hawaiian International Billfish tournament has been held there since 1959. Two sites close-by are the Hulihee Palace and the Mokuaikaua Church. The Hulihee Palace was built in 1838 is one of only three palaces in the United States. Constructed of lava rock and coral, it formerly served as a home for royal families and is now a museum. The Mokuaikaua Church was built by Boston missionaries in 1820 and is the oldest Christian church in Hawaii. South of Kailua Bay is Oneo Bay, a favorite spot for residents and visitors to watch the sunsets. Further south are Kahului Bay and Holualoa Bay. Holualoa Bay serves as a popular place to watch the surfers. 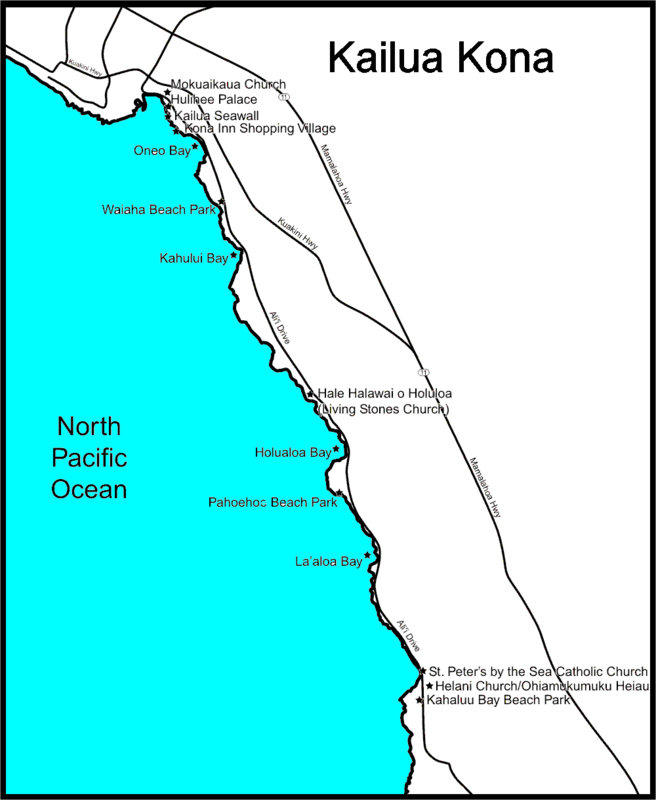 To the south of Holualoa Bay there are a couple of beach parks: Pahoehoe and Laaloa Bay Beach parks. Both have picnic tables and restrooms, making either a great place to take a break if you are walking Ali’i Drive. There are also two historic churches just a little further to the south of Holualoa Bay. St. Peter’s by the Sea is a Catholic Church built in 1880, while the Helani Church, built in 1861, is the site of an old lava rock church. Although it is mostly in ruins now, it is a very interesting place nonetheless. 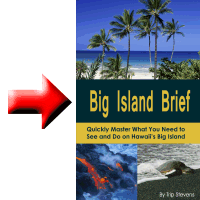 Whether you are a shopper, history buff, ocean lover, people watcher or just plain like to see new interesting things, Ali’i will have something for you.